The prime minister hardly seemed yesterday like a visiting politician trying to persuade voters to elect his candidate as mayor in Diyarbakır. The region's security forces spent the day divided between protecting him and fighting running battles with stone-throwing demonstrators. Prime Minister Recep Tayyip Erdoğan's visit to the region was supposed to be dominated by the start of the new academic year at Diyarbakır Dicle University and a meeting at the local Justice and Development Party, or AKP, branch office in order to devise a new strategy to win over the region. Instead, demonstrations in the region since Saturday over alleged mistreatment of Abdullah Öcalan, the jailed leader of the outlawed Kurdistan Workers' Party, or PKK, spilled over to Monday and tainted the prime minister's visit. 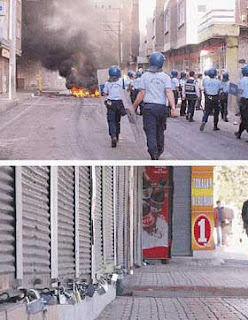 Most shops remained closed throughout the day in protest as roads on the prime minister's route were shut down and police officers in Sikorsky helicopters patrolled from the skies. There were also sharpshooters placed along the route, reported Doğan news agency. Öcalan's lawyers reported he had been assaulted by a guard and threatened with death in his cell on the prison island of İmrali, in the northwest, where he is the sole inmate. Municipal busses did not run and 90 percent of the shops were closed in some sections of Diyarbakır, in line with a call from the PKK, reported the Doğan news agency. Demonstrators pelted officers with stones, burned tires and closed streets, while police fired shots in the air and used tear gas and water cannons. So far, at least one person has died in the street violence. While Erdoğan struggled hard to get votes, his dismay at there being trash on the street probably looks a bit more than ridiculous given the dire poverty of so many of the city's denizens.